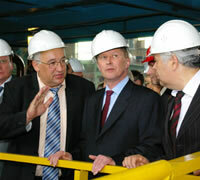 Today’s “PO “Sevmash” FSUE production program can be compared with the Golden Age of Russian shipbuilding. High technologies of atomic submarine fleet are effectively used in civil shipbuilding, offshore structures construction for oil and gas industries and building perspective power complexes. Keeping the priority of state defense order Sevmash is the leading industrial enterprise in Arkhangelsk region and is the city-forming enterprise for Severodvinsk ship-city. In 2006 Russia celebrated historical date – 100 years of submarine fleet. Half of this century is the “atomic” age and it is marked by Sevmash. It is on this plant that the first Russian atomic submarine was built. For the half of the century Sevmash has constructed more than one hundred atomic submarines for Russian Navy. The fastest submarine, the deepest and the biggest tonnage and arming force submarine came from its shipways. These records make the outstanding pages of the ship-building and Naval history. The biggest state military dockyard withstood the periods of change and new economical conditions and continues working for the state defensive. On the 15th of April 2007 atomic submarine cruiser “Yuriy Dolgorukiy”, a head missile carrier of the 4th generation, came from the slipway. Great support in building the ship was rendered by the Moscow Government. Submarines of this project will become the base of naval strategic atomic forces of Russia in the 21st century. The enterprise is actively establishing military and technical cooperation with foreign states. In 2003 – 2005 two diesel electric submarines of export project 636 were built. In the past year after successful completion of testing they got into line of the ordering state. Docking works on the ship of the Indian Navy are almost completed. Specialists from Indian observing group work on the Sevmash, Indian defense department representatives regularly come with inspectional checks. The scope and complexity of the work upon this contract are unique in the world practice. Federal centre pays big attention not only to execution of state military orders, but also to diversification programs. “The plant is producing high-technology civil production and practically reached the previous production volume” said Sergey Ivanov, the First vice chairman of the RF government, during his visit to Sevmash. Indispensable support of the conversion policy are high technologies of the defense industry. Thus long experience in moving ships on the shipway carts was used by Sevmash’s specialists to knurl upper buildings on the upper platform foundation of “Prirazlomnaya”. Unique sea operation was carried out in 2006 after building the lower foundation of “Prirazlomnaya”. First Russian sea sleetproof stationary platform constructed by “Gazprom” JSC and “PO “Sevmash” FSUE has become a reality. Construction weighing about 100 thousands tons today is moored near outfitting embankment of the enterprise and in near future it will be placed on the offshore oil deposit in the Pechora Sea. Sevmash capacities upgraded for the platform construction and its experience in hydroengineering operations surely will be used in serial production of different types of marine structures. Marine multi-purpose semi-submersible platform MOSS CS-50 pontoons are already moved out from the shipway workshop. The order for three similar structures was placed on the enterprise by Norwegian company “Moss Мosvold Platforms”. At present stabilizing columns and upper deck of the first platform are being assembled in the water area of the enterprise, second structure pontoons are being formed on the shipway. This is the only enterprise in Russia which can build extensive high-technological structures for marine oil and gas production. The objects for developing Stockman gas-condensate deposit and plant modules for natural gas liquefaction from Yamal peninsula deposit can become perspective orders for Sevmash in this field. The first Sevmash’s ships, battleships “Sovetskaya Rossiya” (Soviet Russia) and “Sovetskaya Belorussiya” (Soviet Belarus), have no luck to leave slipway in the 40`s of the past century, their hulls having being dismantled on the shipway. Since then Sevmash has not built surface ships and large displacement ships, although such capacities were put in the project of the plant. Shipway production capacity allows the building of surface ships with displacement of up to 100 thousands tons including ships with nuclear power plants. In the 21st century large-capacity ship-building got new impulse. 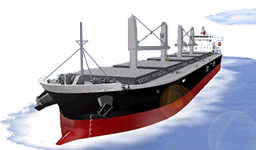 Sevmash started building chemical tankers with displacement of 45 thousands tons. Large Norwegian shipping company “ODFJELL” showed great interest to the building of tanker fleet on the North of Russia. 3 complete packaged vessels are already founded on the shipway, the head tanker will leave the building dock this year. Sevmash continues building presentational class vessels with no analogues in Russia in terms of dimensions, comfort and installed power. Building VIP class cruise ships is another aspect of using dual-purpose technologies especially in processing and welding light alloy hulls. Sevmash is by right the “cradle” of ship nuclear energy. Half a century ago the first Soviet ship with nuclear reactor was built here. New age raised new tasks. Today enterprise builds experimental power plants, which in near future will be able to change power supply system of Russia. On the 15th of April 2007 head floating power unit of the lower-power atomic thermal electric power station was founded on Sevmash. This development is “know-how” not only in Russia, but in the whole world. Such stations are most effective for heat and power supply to remote littorals, military bases, oil and gas industry worker’s settlements. According to the contract Sevmash will build floating power unit and coastal station structures on its territory. Building floating atomic thermal electric power station is safer and cheaper than ground station. First such station is planned to set in operation in 2010 by “Concern “Rosenergoatom” (Russian atomic power concern) FSUE. Great demand in these complexes already justifies theirs serial production which is the ideal way of conversion for military dock. Parties already signed intention declaration for building 6 floating atomic power units. Renewable energy is another key factor of the Russian energetic strategy realization. In this framework the equipment for Kislogubskaya tidal power plant was built at Sevmash. Experimental power unit which was built in 2006 is equipped with unique orthogonal water turbine which does not change the direction of rotation during high and low tides. Technical and operating projects were developed by Sevmash designers. Development of modern technologies and depletion of hydrocarbon resources lead the scientists towards natural forces energy. 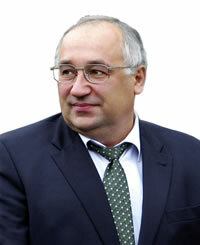 Sevmash’s experience will be a foundation for industrial production of tidal power plants in Russia. The dock advantages are obvious, floating construction (when power unit is building as an ordinary vessel and then towed afloat to the installation place) allows to decrease the cost of works by 40%. Sevmash has maintained and keeps on developing production of engineering products for ship-building industry, it produces equipment for metallurgical, oil and gas, chemical and other Russian and foreign industries. For the past few years mechanics of Severodvinsk mastered high-technological products for atomic industry. In the past year production of large series of transport packaging containers for spent nuclear fuel was completed. Sevmash’s products and technologies are commendably represented on the largest Russian and international exhibitions. The enterprise is a permanent participant of International Naval Salon, “High Technologies of the 21st Century” exhibition. In 2007 Sevmash was awarded a diploma of Ministry of Industrial Power of the Russian Federation at International Hannover Fair in Germany. According to the decree of the President of the Russian Federation of 21 March 2007, the operations of integration “PO “Sevmash” FSUE into the “North Center of Ship-Building and Repairing” JSC were started at the enterprise. In turn this organization will become a part of “United Ship-Building Corporation” JSC created in order to maintain and develop research and production potential of the military industrial complex, ensuring state safety and defensive capacity, concentrating intellectual, manufacturing and financing resources during ship-building and submarine building projects realization for Navy, developing civil ship-building, developing continental shelf and world marine transport market. During reorganization it is necessary not to decrease the pace of construction, not to lose interplant cooperation and approved suppliers of materials, not to lose experienced managers and to gain maximal benefits, which can be achieved with the help of new organizational and legal form of the enterprise. Traditionally at Sevmash a big attention is paid to personnel and social policy. Plant employs more than 800 new workers and specialists annually, the salary constantly growing. At All-Russian competition Sevmash’s personnel service was considered the best service in Russia. Production stability allows to carry out social programs, enhance the medical base of the sanatorium-preventorium, Black Sea vacation hotels, departmental medical and sanitary units, upgarde culture and sport facilities. In 2006 for the substantial contribution to the development of the ship-building and creating new samples of special machinery the President rendered thanks to the team of Sevmash which is the highest mark of distinction in Russia today. Large group of shipbuilders are given state awards. High confidence of the head of state and government of Russia in the team of Sevmash is the acknowledgement of present and the pledge of the future labour successes.